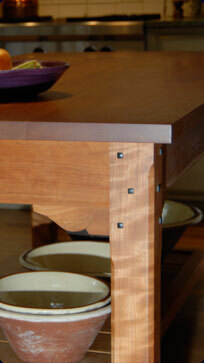 A Greene & Greene inspired kitchen work table made from solid cherry with ebony pegs. 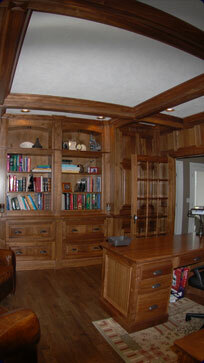 A home office with Walnut paneled walls, coffered ceiling and custom cabinets and desk. 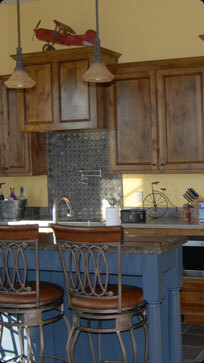 A kitchen with Rustic Alder cabinetry and a painted island. A traditional Morris chair in quartersawn White Oak and leather. 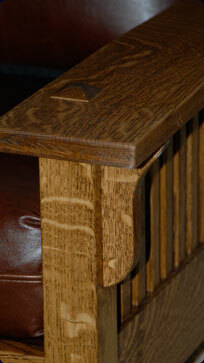 Willamette Valley Fine Woodworking is one of Oregon's premier builders of custom furniture and cabinetry. We work closely with our clients to ensure that our designs meet their functional and aesthetic requirements. From individual furniture pieces to custom kitchens and baths, our quality, service and personal attention to every detail of your project is unsurpassed. Northwest Fine Woodworkers show at the Oregon Convention Center, Portland, OR. April 29, 30 & May 1, 2011.